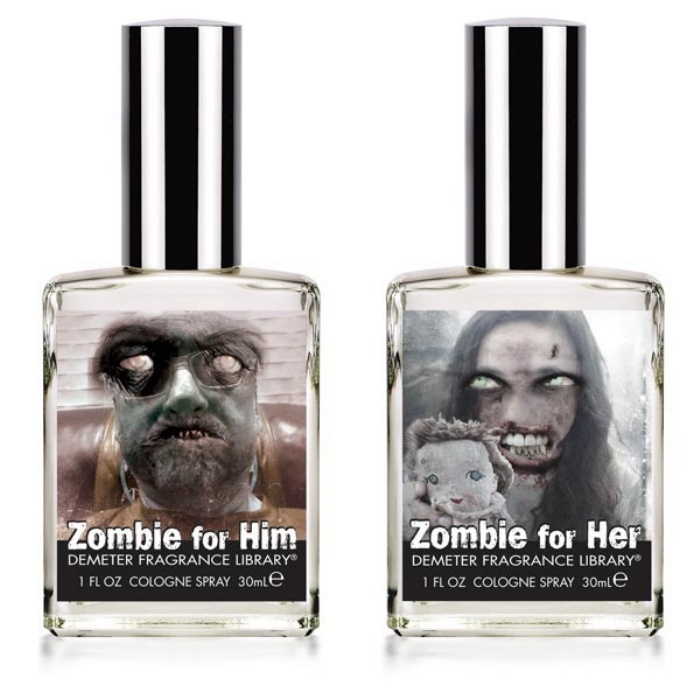 Eau de Zombie: Now You Can Smell Like the Living Dead | OhGizmo! By Hazel Chua on 03/13/13 • Leave a comment! Ever wondered what zombies smelled like? Since they’re basically dead and rotting humans that have been somehow brought back to life, I doubt they’ll smell like the roses you just picked from your garden. According to quirky fragrance maker Demeter, however, zombies smell like dried leaves, mushrooms, mildew, moss, and earth–at least, the male ones, that is–and now they’re giving you the chance to smell like one with their latest perfume offering: Eau de Zombie. It’s probably all for the best that they decided to forego adding the essence of rotting human flesh, don’t you think? They created a female version of the perfume, too, that’s a toned down version of the Men’s fragrance with a touch of Dregs for a bit of a feminine touch. Neither sounds very appealing, but hey, who ever heard of a zombie that was in the first place?